The Kanex International Power Adapter is the ideal wall adapter for anyone who travels abroad. Many travel adapters can handle voltage and cycle differences, however, the physical plug still remains a barrier. 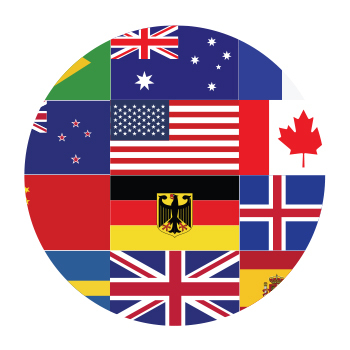 Our 4-in-1 compact international power adapter gives you charging capabilities in more than 150 countries supporting an input range of 100-240V. 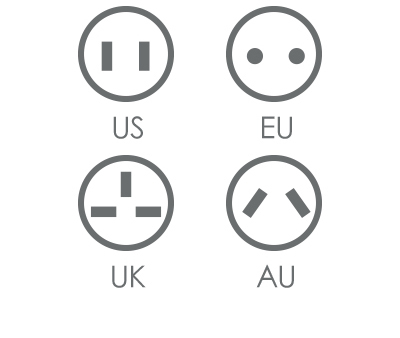 Plugs from the US, UK, EU, and AU are already included. The International Power Adapter has two built-in USB ports with a total output of 2.1A allowing you to charge a smartphone and your tablet or a similar device simultaneously. Compact and Ready for Worldwide Adventures. The Kanex International Power Adapter’s 4-in-1 intuitive design makes it easy to select the correct plug for your power needs when traveling abroad. Easily pop out your desired prong by pushing and sliding the side lever. A blue LED will light up once you are connected to a wall outlet. 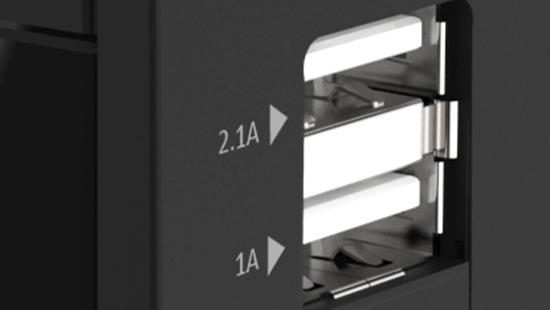 USB ports are compatible with all USB powered devices.